Kawasaki XP-1 is a new maritime patrol aircraft under development for the Japan Maritime Self Defence Force (JMSDF). Image courtesy of Toshiro Aoki (www.jp-spotters.com). A Kawasaki XP-1 maritime patrol aircraft flies along with P-3C aircraft. Image courtesy of hvhv. A rear view of the Kawasaki XP-1 maritime patrol aircraft at Atsugi Air Base. Image courtesy of Hideo Frame. Kawasaki XP-1 (previously known as P-X) is a maritime patrol aircraft being developed by Kawasaki Heavy Industries for the Japan Maritime Self Defence Force (JMSDF). 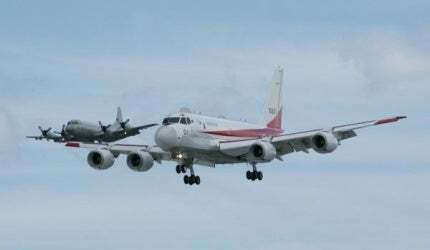 It is intended to replace the P-3C maritime patrol aircraft operated by the JMSDF. The Ministry of Defence received the first test aircraft in August 2008. Kawasaki delivered four XP-1 maritime patrol test aircraft to the Ministry of Defence by March 2010. The Japanese defence ministry found tears in several parts of the test aircraft during ground testing in August 2011. The fuel tank and central part of the fuselage were reinforced after repairs. The Japanese Ministry of Defence began the development of XP-1 and the C-X transport aircraft to replace the ageing P-3C fleet. The Japanese Ministry of Defence began the development of XP-1 along with the C-X transport aircraft in 2001 to replace the ageing P-3C fleet. It is the first indigenous development programme covering the development of two large aircraft under a single project. In November 2001, Kawasaki was selected as a prime contractor to develop these aircraft along with other equipment manufacturers and suppliers. The XP-1 and XC-2 use many common structural components and equipment. The airframe, engines and the patrol systems are developed indigenously. The project also employed combined-off-the-shelf (COTS) products to achieve cost reduction in development and production. The XC-2 and XP-1 are being built concurrently to reduce production costs. The forward fuselages and horizontal tails are of a robust, lightweight and cost-effective composite material made from carbon fibres. The wing-body fairings for the P-X are supplied by NIPPI Corporation. The fairings reduce drag by overlaying the joint between the main wing and fuselage. The aircraft carries up to 13 crew members. XP-1 has a length of 38m, wingspan of 35.4m and a tail height of 12.1m. The maximum take-off weight of the aircraft is 79.7t. The latest technologies provide the XP-1 with higher speed, greater range and useful load than the P-3C aircraft. The latest technologies provide the XP-1 with higher speed, greater range and useful load than the P-3C aircraft. The aircraft incorporates the fly-by-light (FBL) system which offers increased resistance to high electromagnetic interference (EMI). The FBL system uses fibre optics to transfer flight control commands at higher speeds. The external pylons of the XP-1 can carry wide range of weapon systems such as anti-ship missiles, air-to-surface missiles, torpedoes, mines, depth charges and bombs. The aircraft can also deploy sonobuoys while conducting anti-submarine warfare missions. The XP-1 is powered by four F7-10 turbofan engines of Ishikawajima-Harima Heavy Industries. The aircraft is equipped with new acoustics and phased array radar systems with enhanced capabilities for detecting and tracking submarines and small vessels. The sensor suite integrates HPS-106 Active Electronically Scanned Array (AESA), magnetic anomaly detection (MAD) system and Infrared/Light detection systems. The MAD system ensures the detection of submarines by finding magnetic variances made by a submarine in the Earth’s magnetic field. The P-1 will also be fitted with an artificial intelligence system to support TACCO mission. The advanced onboard combat direction system provides the TACCO operator with the best flight path to attack a submarine. The aircraft can be integrated with radar warning receiver, missile warning system, electronic support measures and countermeasures dispensing systems. The XP-1 is powered by four F7-10 turbofan engines of Ishikawajima-Harima Heavy Industries. Mounted below the low-set wings, each engine generates a thrust of 60kN. The high bypass ratio turbofan engine achieves low fuel consumption and low noise levels. The engine has an inlet diameter of about 1.4m and length of about 2.7m. The power plant provides greater flight range and maximum cruise speed to the aircraft. The Hayabusa class guided missile patrol boats were built by Mitsubishi Heavy Industries (MHI) for the Japan Maritime Self-Defence Force (JMSDF).